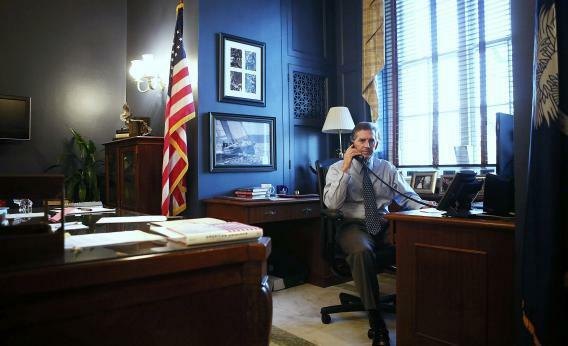 Jim DeMint talks on the phone in his office December 6, 2012 in Washington, DC. The Democrats generally represent those things that are big. Big corporations, big banks, don’t give to Republicans. They give to Democrats. Big corporations are not conservative, they’re playing government to get something out of it. But if you look at OpenSecrets’s guide to third-party spending in 2012, most “big” business interests preferred Republicans over Democrats. The securities industry spent $70.4 million on Republicans, and $18.5 million on Democrats. The business services industry spent $21.5 million on Republicans, and $7.4 million on Democrats. The only element of the financial industry that broke blue was commercial banking—$2 million for Ds, $1.6 million for Rs. But if you combine all the Super PAC and 501(c)(3) donors in the sector, they gave $112.2 million in support of Republicans and $41.4 million in support of Democrats. In 2008, at a low ebb for the Republican Party, Barack Obama was unusually successfully in lining up Wall Street support for Democrats. In 2012, as was reported basically everywhere, Mitt Romney was able to reverse that trend. And Democrats, in an act of great chutzpah, pretended that Romney and only Romney was going to be the tool of these interests. So part of the Republican rebrand is flipping that onus back on the Dems, whether or not the money trail leads to them.